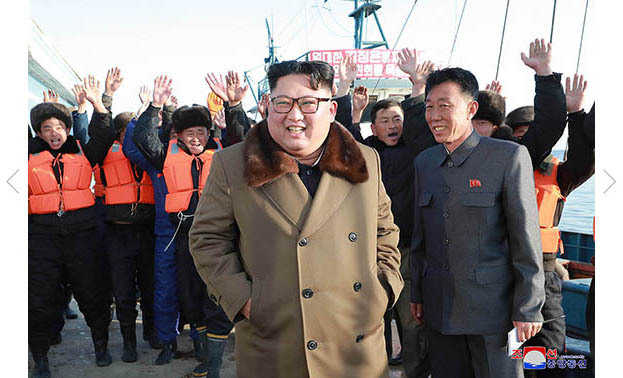 Pyongyang: Kim Jong Un, Chairman of the Workers' Party of Korea, Chairman of the State Affairs Commission of the DPRK and Supreme Commander of the Korean People's Army, gave field guidance to the fishery stations in the eastern coastal area which are busy with winter intensive fishing campaign. The first leg of his guidance was the May 27 Fishery Station run by the KPA. Saying that he came to encourage fishermen with a great pleasure after receiving a report that they caught more than 60 000 tons of fish in a short span of time in the course of receiving every day a report on the fish catching of the fishery stations run by the People's Army in the eastern coastal area in a winter intensive fishing campaign, Kim Jong Un personally got aboard the fishing vessel "Hwanggumhae-014" and congratulated its captain and fishermen who returned with a big fish haul. He noted that he is much pleased to see the unloading of fresh fish from the vessel and the fish which is poured out at an outdoor ground. Saying that he wants to have a photo taken against the background of that wonderful scenery, he summoned the fishermen and employees and had a significant photo session.